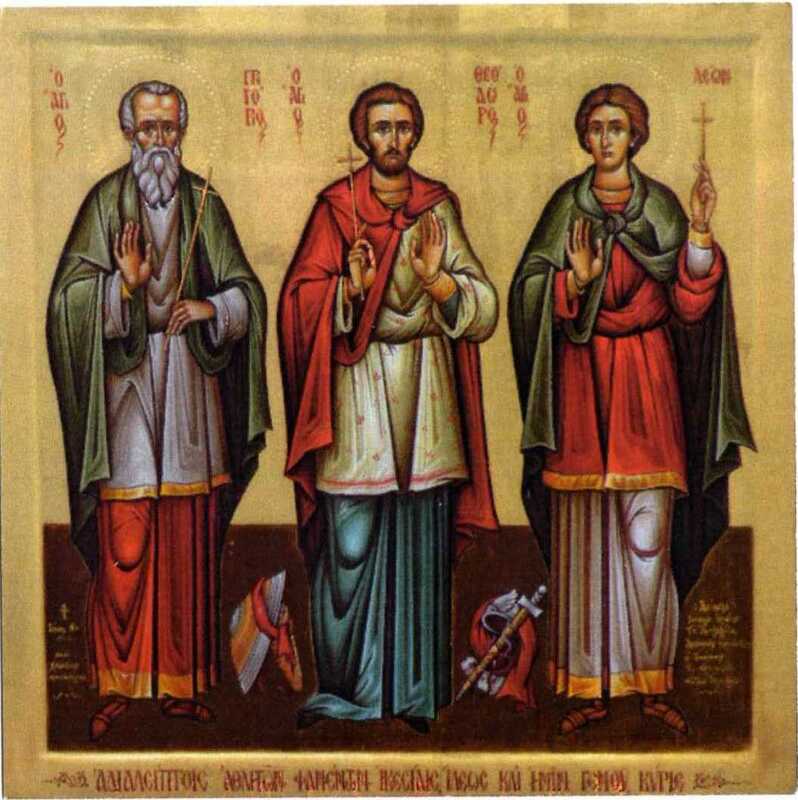 Saints Gregory, Theodore and Leon, served as soldiers in the Roman army in the 4th century AD. Believing vigorously in the truths of the Gospel, under the heretical emperor Constantius they left the army so that they would not be forced to profess the Arian heresy. 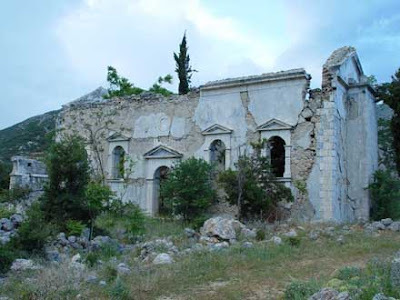 Leaving the island of Sicily, they fled to an area now called Sami on the island of Kefalonia, where the athletes and soldiers of Christ remained until the end of their lives in asceticism. Many years after their Dormition, their sacred remains were revealed in a miraculous manner. A rich ruler of the island named Michael was afflicted with leprosy, and the Saints appeared to him in the form of Angels, and revealed to him that he would receive healing by finding their remains. He went to the indicated, secluded place, and found the unburied, incorrupt (after hundreds of years), and fragrant bodies of the three Saints. He embraced them and received complete healing. Out of gratitude he build a church and monastery in their name (Agion Fanenton, which means the Holy Revealed Ones) where their Relics remained until they were removed by the Latins during Frankish rule (sometime between 9th-14th centuries). 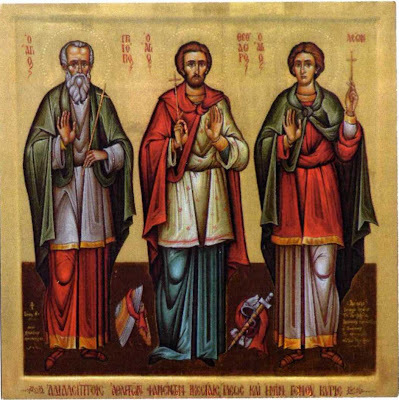 The missing holy relics of these three saints, were finally located on the 30th of January 2009 in Church of the Prophet Zacharius in Venice. A small portion of the Relics was given to the Holy Metropolis of Kefalonia. On February 1st 2009, these Relics were transferred back to Greece (temporarily to the church of St. George Vouliagmenis, and then to the pilgrimage in Kefalonia). 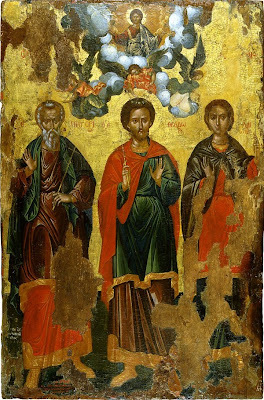 The memory of the Holy Revealed Saints Gregory, Theodore and Leon, the Confessors of Orthodoxy who lived in asceticism on the island of Kefalonia is celebrated on the Sunday of All Saints (the Sunday after Pentecost) by the Orthodox Church. February 1st might also be considered a feast of theirs commemorating the transfer of their relics back to Kefalonia. 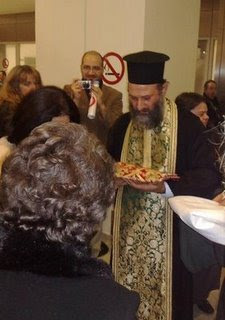 For video of the Holy Relics of the Agion Fanenton visiting the church of St. Barbara, Patras, and the Paraklesis service, see: http://www.i-m-patron.gr/news1/news_2009/010509_agioi_fanentes_vid.html. Απολυτίκιον. Ηχος δ'. Ὁ ὑψωθεὶς ἐν τῷ Σταυρῷ. Τούς κεκρυμμένους ἐπί πλείονα χρόνον, ἀναφανέντας τῷ σεπτῷ Οἴκῳ τούτῳ, Γρηγόριον, Θεόδωρον καί Λέοντα, τούς μεγαλομάρτυρας καί πιστούς ἀριστέας, πάντες εὐφημήσωμεν καί θερμῶς εκβοῶμεν καί ανυμνοῦντες κράζομεν ἀεί, χαίρετε μαρτύρων τό καύχημα. Those who were hidden for many years, are once again revealed in this sacred House, Gregory, Theodore and Leon, the great martyrs and faithful servants, let us all praise them and fervently cry out and ever hymn them crying, hail the boast of martyrs. Κοντάκιον τῶν Ἁγίων Φανέντων. Ἐπεφάνης σήμερον. Ἐν ψαλμοῖς ὑμνήσωμεν, ὀρθοδοξίας, τρεῖς ἀστέρας λάμποντας, ἀναφανέντας θαυμαστῶς, καὶ γηθοσύνως δοξάσωμεν, τὸν ἐν Μονάδι, Θεὸν τὸν Τρισήλιον. Τὸν θησαυρὸν τῶν ἁπάντων σφοδρῶς ἀγαπήσαντες, καὶ διδαχὰς τοῦ Κυρίου τηρήσαντες πάσας, τῆς πίστεως ἐδείχθησαν ἀριστεῖς φαεινότατοι, οἱ πιστοὶ ὁπλῖται. Ἐπουρανίων οὖν στρατιῶν κοινωνούς, Γρηγόριον, Θεόδωρον καὶ Λέοντα, ἱκετεύσωμεν οἱ πόθῳ τιμῶντες τὴν πανθαύμαστον αὐτῶν πολιτείαν τε καὶ εὔρεσιν, ὅπως παντοίων ὁ Σωτὴρ κινδύνων ἡμᾶς ῥύσῃ, οὐρανοδρόμον τε ἀναδείξῃ τὸν βίον, ἵνα ἀεὶ δοξάζειν ἀξιωθῶμεν, τὸν ἐν Μονάδι Θεὸν τὸν Τρισήλιον. In psalms let us hymn the three shining stars of Orthodoxy, who shone again wondrously, and together we glorify the Three-sun God in Unity. The treasure of that which is greatly loved by all, and teachers of the Lord who have kept all things well, they were shown to be most radiant and faithful soldiers of the faith. For these soldiers, Gregory, Theodore and Leon, were communicants of the things above. We entreat them and with fervor honor their most-wondrous life and the finding of their relics, that the Savior of all may deliver us from all danger, and show us the way to heaven in life, that we may ever worthily glorify, the Three-sun God in Unity.